Hey! My name is Kerry and I'm an electric/acoustic guitar/ukelele player based right here in Austin, TX. I've been playing guitar for over fifteen years and I have played professionally with the Army Band for over seven years. 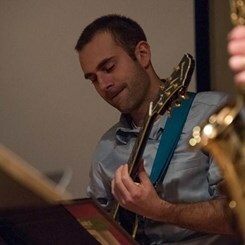 I have a Bachelor's Degree in Jazz Guitar Performance from Texas State University and I've played in various different groups with styles ranging from r&b, country, rock, pop, soul/funk, latin, and jazz. I love to teach and share my musical knowledge with my students and I always try to cater to their musical goals and develop a plan that works best for them. Come on by and let's jam! Request Lessons with Kerry today!